Double locking doors with brushed silver finished handles. This pulpit works very well at a restaurants entrance. 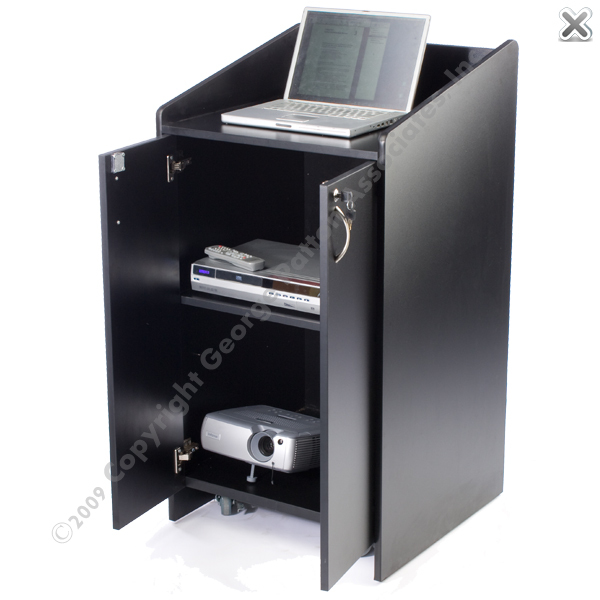 A preacher could use this lectern as a pulpit, or other church furniture. 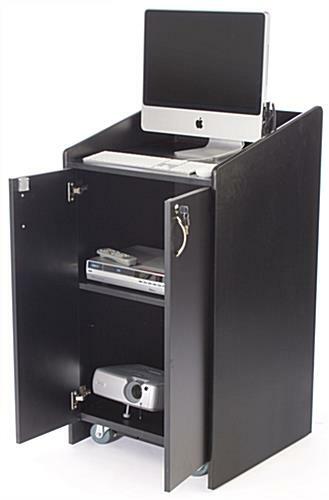 This pulpit is useful for a church or meeting room. 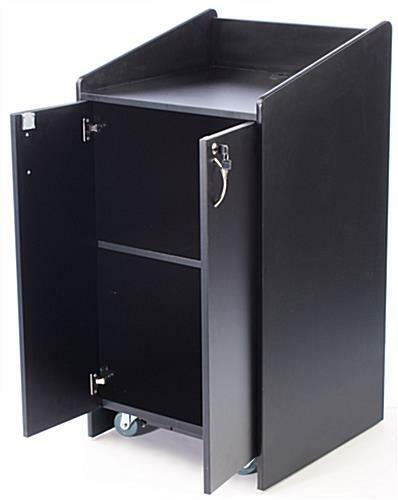 This pulpit, such as sermon podium, church lectern or communion table has 4 industrial casters that can be locked to keep the pulpit in place. This pulpit has 4 wheels, making it easy for one person to move. Our pulpit comes with 2 sets of keys so that if one set is lost, a sermon can still go on with another set. A pulpit, such as church podium or lectern has 2 locks, one on each door so you can access items on one side without having to unlock the entire unit. Our church pulpit has cable ports throughout so if the sermon needs a sound system, it can be installed and wires can run seamlessly throughout and not be exposed to the congregation. 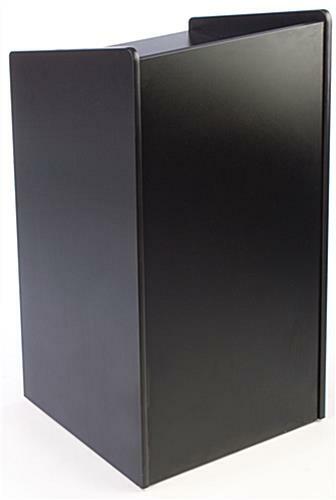 A lectern, such as pulpit or podium has rubberized edges so if the unit should bump into a wall while moving it, this rubber edging will help protect the unit and wall. 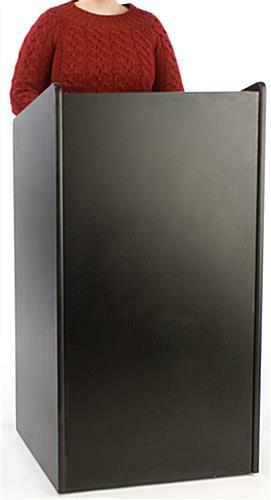 Our pulpit has brushed silver finished handles to give this podium a slightly contemporary look. 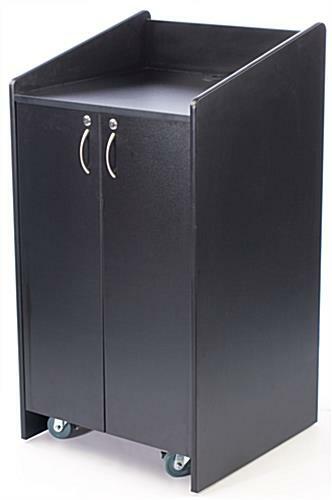 This pulpit has 2 interior shelves, one that is the base, and the other can adjust to your desired height. This single adjustable shelf has 6 height positions it can be placed in. These adjustment positions are 3" apart, and can vary the shelf height from 10" to 24-1/2". On this pulpit, such as podium furniture or church lectern to adjust the shelf, just pull out the shelf and the 4 shelf holding pins, place these pins in your desired height locations, and put the shelf back inside. 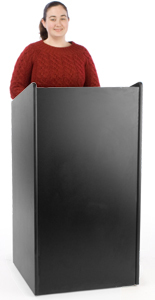 This podium is made of 3/4" laminated MDF surface for durability and stability. This pulpit, such as church podium ships fully assembled. 27.8" x 45.0" x 25.0"